reply in Lok Sabha. He said the ratio was 17.48 judges per million population in 2014 in our country. The sanctioned strength of judges of high courts increased from 906 judges in June 2014 to 1,079 in December 2018. The sanctioned strength of Judges of the district/subordinate courts rose from 20,214 in 2014 to 22,833 in 2018. Performing strength of judges in high courts, although is 673, while for the Apex Court it is 28 against the sanctioned strength of 31. India has nineteen judges per ten lakh people on an average, according to a Law Ministry data which also states that the judiciary faces a combined shortage of over six thousand judges, including over five thousand in the lower courts itself. According to the data, part of a document prepared in March this year for discussion in Parliament, the judge-population ratio is 19.49 per million (ten lakh) people. The document states that while the subordinate courts have a shortage of 5,748 judicial officers, the twenty-four high courts face four hundred six vacancies. Performing strength of the lower judiciary is 16,726 while the approved strength is much higher at 22,474. In the case of the various high courts, the approved strength is 1079. The actual strength is 673. The Supreme Court, with a sanctioned strength of thirty-one judges, has six vacancies. Thus, the total number of vacancies in the SC, the HCs and the lower courts come to 6,160 judges. 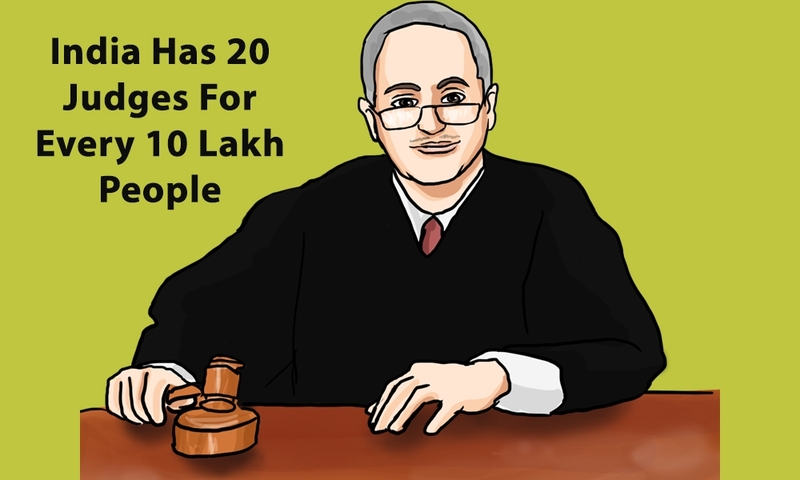 The debate on the judge-population ratio was re-ignited by then Chief Justice of India T S Thakur in April, 2016 when in the presence of the Prime Minister, he had lamented the governments inaction in increasing the number of judges from the present 21,000 to 40,000 to handle the avalanche of litigations saying, You cannot shift the entire burden on the judiciary. He had said nothing has moved since 1987 when the Law Commission had recommended an increase in the number of judges from ten judges per ten lakh people to fifty. The Commission had according to the government of India found that in the absence of complete and scientific approach to data collection across various high courts as well as lower courts, the actual rate of disposal method to calculate the number of additional judges required to clear the backlog as well as to ensure that the new backlog is not created, is more pragmatic and useful manner. Recently, Law Minister Ravi Shankar Prasad had urged chief justices of the twenty-four high courts to speed up recruitment of judicial officers for the lower judiciary as one of the reasons for high pendency is lack of judges in every court. He had urged the chief justices to hold timely examination and interviews to recruit judges for lower courts. In his August 14th letter Prasad pointed out that there were a total of 2,76,74,499 cases pending in the District and Subordinate Courts of the country. Main underlying cause behind the high pendency is sometimes the inordinate delay in filling up the vacancies of judicial officers he wrote in the almost identical letters. Why Lawyers Are Called Learned Friends?